Over the past few years, whipped coconut cream has become one of my favorite tricks I’ve come up with in the kitchen. I love whipping up (literally) a batch for dinner guests, not even bothering to tell them it isn’t heavy whipped cream. I love how amazed people are when I tell them that it’s totally vegan and just 3 simple ingredients. I have shared how to make this glorious stuff within several of my recipe posts before, but I thought what better way to kick off my new Tutorial Tuesdays series than with this favorite how-to! Plus, since canned coconut milks can vary drastically, I wanted to give you my comparison of 5 different coconut milk brands. You’ll be shocked at how different each one is. Because of the vary degrees of whipability (is that a word?) – the results and the work can be quite challenging if you choose incorrrectly. Due to the different stabilizers in each brand and sometimes even where the coconuts originate from, these can cause the much needed separation of the coconut cream from the water to just not work – no matter what you do. Outside of the varying brands, I have also read that extra air in the can, may also cause less separation to occur. This isn’t something I have tested too much myself, but if you want to shake cans of coconut milk at the store, I say go for it. You are listening for little to no swishing around of the liquid in the can. Whipped coconut milk is creamy, rich and thick, much like traditional whipped cream and the coconut flavor is very faintly there. Not nearly what you would expect it to be. 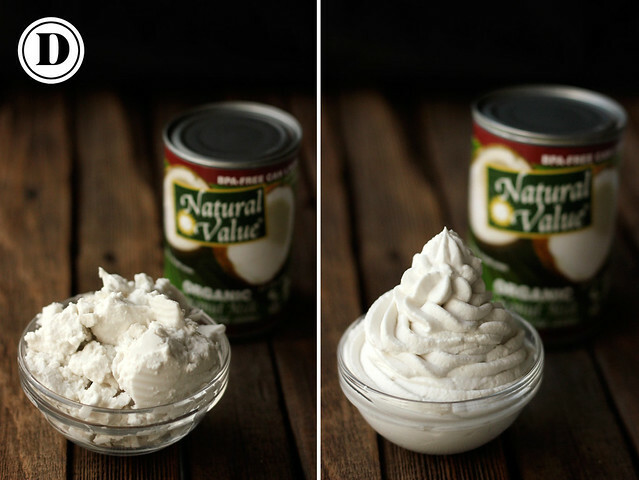 The best part about homemade whipped coconut cream is all of it’s many uses and how much you can vary the flavor. You can add raw cacao powder for a chocolate cream, muddle some fruit and fold that in, maybe a squeeze or two of your favorite citrus, or even just a good quality all natural extract, you can even add a bit of your favorite liqueur. 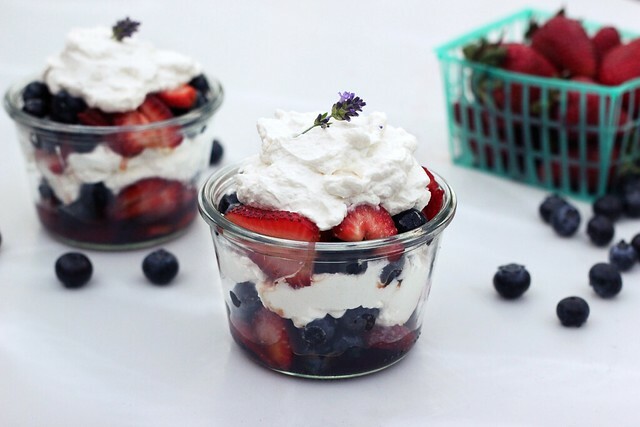 It would be hard to choose my favorite way to customize my homemade whipped coconut cream, but the easy part is actually making it. So, let’s get to it. Refrigerate one can of full-fat coconut milk overnight (see my brand selections at the bottom of this post). Carefully open up the can. There will be a layer of firm, waxy, thick white layer of coconut cream on top. Save the coconut water for another use, like smoothies. With your mixer or hand beaters on high speed, whip the coconut cream for 3 to 5 minutes until it becomes fluffy and light, with soft peaks. Mix in your sweetener and vanilla extract, if using. 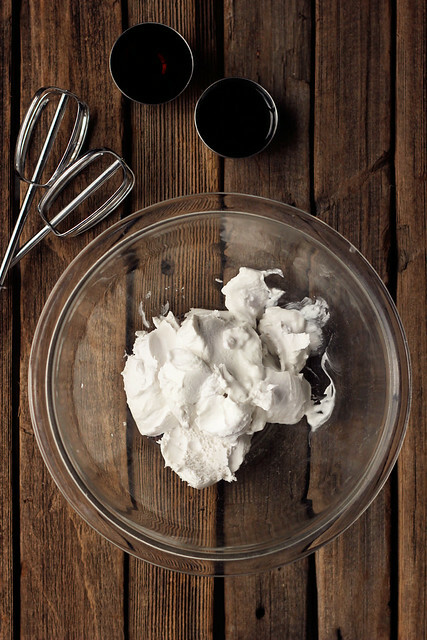 Voila, homemade whipped coconut cream, in minutes. Scoop out the coconut cream and into a large bowl or the bowl of a stand mixer. (If it is hot in your kitchen, place your mixing bowl in the freezer for 5 minutes or so.) Stop scooping when you reach the water in the bottom of the can. Save this for smoothies or drink it as is. Just don't add this into the solid cream for whipping. 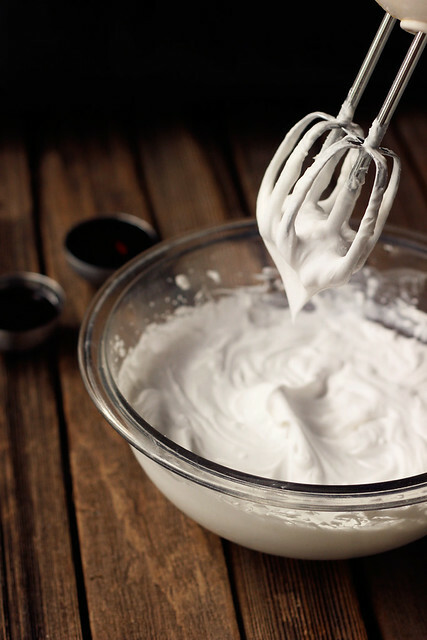 Using a mixer or hand beaters on high speed - whip the coconut cream for 3 to 5 minutes until it becomes fluffy and light, with soft peaks. Mix in your sweetener and vanilla, if using. 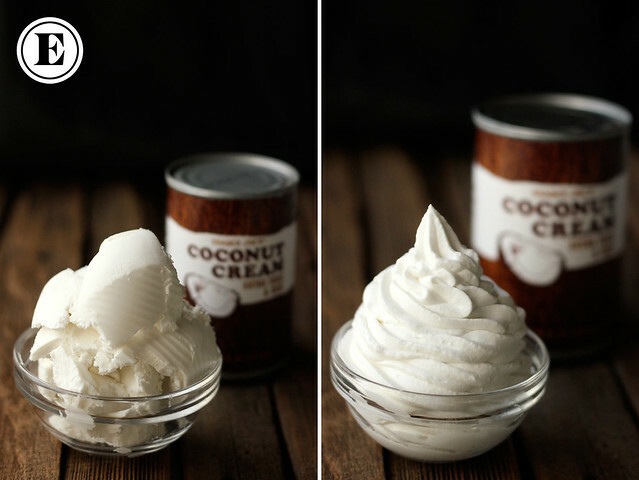 Whipped coconut cream is best served immideately, but can be stored in an air tight container for up to a week. It will harden in the fridge, the longer it stays chilled, simply mix until creamy again, when ready to serve. 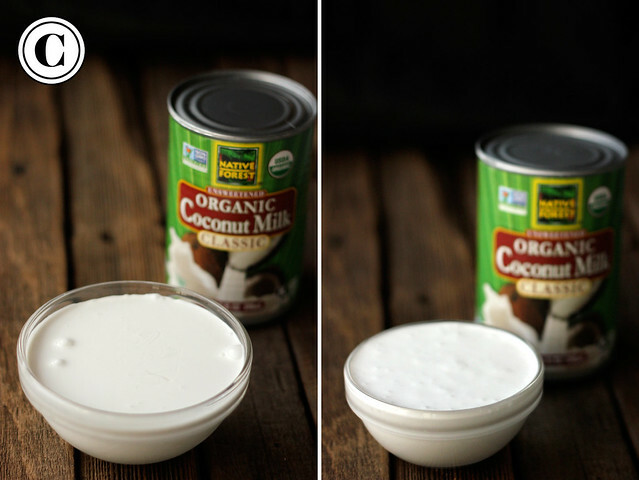 Alternatively, if you know that your coconut cream is good and solid (meaning a brand you have used before and can trust), you could turn the can upside down, open the bottom of the can instead and pour out the coconut water that way. This will only work if when you turn the can upside down, your coconut cream is so solid that it won't move. Out of the can: The coconut cream separated perfectly and was very easy to scoop away from the water. It was thick, waxy, smooth and very creamy. 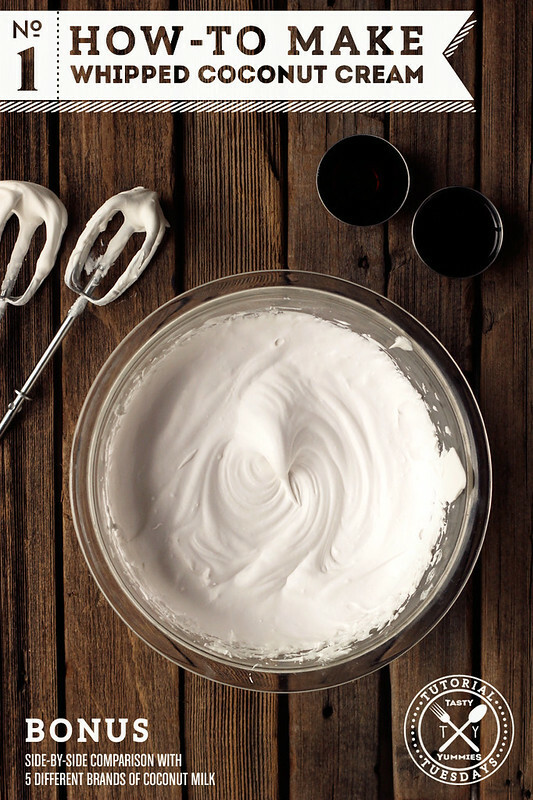 When whipped: Whips up nicely, has a nice, light quality, it’s creamy and smooth and bright white in color. Very easy to pipe and holds it shape pretty nicely. Notes about the product: I sampled both the organic and the regular. Both produced the same results. In the past I have had issues with this brand separating properly (a year or two ago), but had no issues this time with two different cans. I was quite please with this brand. I am curious if they change their formula and ingredients, from time to time. BPA claims: No mention on the can itself. Out of the can: Not easy to separate the coconut cream from the coconut water, very thin, not waxy at all. When whipped: Thickens up a bit when whipped, but not too much. Not easy to pipe and doesn’t hold it’s shape. Notes about the product: Some people swear by this brand for whipping, I have never had good results with it. Out of the can: Very thin, nearly impossible to separate the coconut cream from the water, not waxy or thick at all. Notes about the product: I have bought this brand in the past and it whipped up perfectly, this used to be my favorite brand – hands down. However I tried two different cans during this testing, both with the same results. I am guessing they must have changed something about their product. EDIT 06/15/14 – I have since had a cans of Native Forest that worked perfectly, sadly they just aren’t consistent at all. Out of the four cans that I bought last week, two set up perfectly with a thick waxy layer of coconut cream and two did not. Out of the can: Very thick and waxy, somewhat crumbly. Feta cheese type consistency. When whipped: Whips up really nicely, thick and light. Not quite as smooth and creamy as Thai Kitchen or the Trader Joes Coconut Cream, but this is likely due to it not containing any gums or additives. Also has a very very subtle grey tint to it, versus a perfect bright white. Great flavor. Notes about the product: Nothing extra added! Out of the can: No separation to deal with, as the can ONLY contains coconut cream, no coconut water. Very thick and waxy, creamy and thick. Great flavor, a tad sweetener than the other brands. When whipped: Whips up really nicely and easily. Very thick and sturdy, light and holds it shape. Notes about the product: I found this product to be a hint sweeter than the others and the flavor wasn’t nearly as “natural”. Just because you find a brand that works, doesn’t mean it always will, same goes on the flip side. They must change their formulas, ingredients or other details that can affect this. 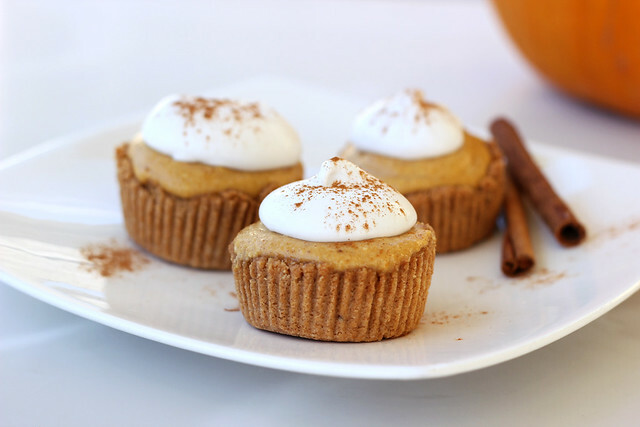 OTHER SERVING IDEAS: Whipped coconut cream is also great served on top of fresh fruit, hot cocoa and other other hot beverages, chia puddings, pies, tarts, crumbles, pancakes, you can also add a little coconut oil and place it into the fridge to make a whipped frosting for cupcakes or cakes – the possibilities are endless. Use it however you would regular whipped cream, or heck – just go ahead and eat it with a spoon. Thanks so much for this! It was suuuuper helpful. Well done! This will be helpful to so many. I like that you aren’t biased … just giving the peeps info and letting them decide. Nice post!! Thanks so much for sharing this. It is obvious you put a lot of time and effort into your thorough research and presentation of the information. If this is any indication of the high caliber information you will be presenting on Tutorial Tuesdays I can’t wait until next week! Thank you so much Valerie, it was definitely a ton of work, but it was really fun. I might have felt a little bit like Alton Brown getting all investigative 😉 I hope I can keep up this level of excitement in coming weeks. I have soo many good ideas, I just need to get cracking. Please feel free to post any suggestions for tutorials you’d like to see. Love the canned comparison. Thai Kitchen is definitely the best of the “conventional” ones, I’ve learned that the hard way trying to whip Goya before. No dice. Thanks so much, Gina!! Oooh I never tried Goya, I guess that’s a good thing. I cannot get over how crazy different each of them are. 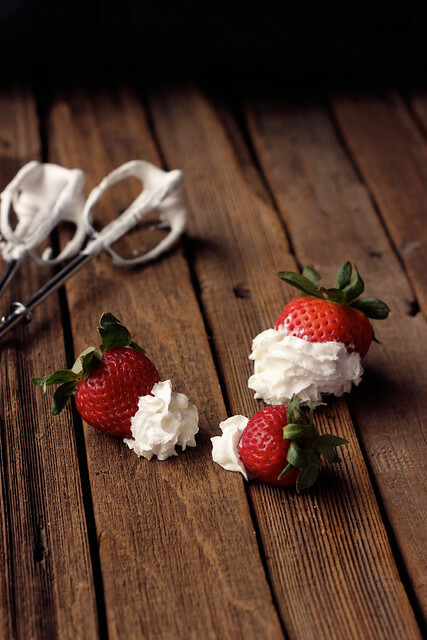 This is a fantastic idea – I’ve had some whipped coconut cream disasters in my kitchen! I’m in Australia and can’t access these brands though. I have a hunch that part of the problem I have had is that I have tried with only 100% coconut cream. If you were able to post the % coconut content for each tin, I’d be so grateful. Thanks so much! Thanks Blythe. I don’t believe that this information is labeled on the cans, but I will double check and get back to you on that. Love your first tutorial Beth!! You are gonna be eating whipped coconut cream for days. :) I am just down the street if you need help. Thanks for the insight. I never really thought about comparing brands like this, but it is helpful. Thank you! Thanks Meg, so glad you like it! Thanks for the all the hard work you put in for such great recipes and tips! I’ve been wanting to order the Natural Value coconut milk for a long time because it’s BPA-free and has no stabilizers, but put it off because the Thai Kitchen is so much easier to get and I was worried it would be a lot different. Thank you!! I whip my coconut cream often (it’s so good in my tea) and I find, at least for the Thai Kitchen brand that it’s nice and easy to open from the bottom of the can and pour the liquid out first. 🙂 Love your little space here! Thanks again! Yes, thank you for all you do on these recipes! I tried your Hawaiian bread (loved it ~ was the type of recipe I had been searching for) and ended up making it again~ but into a King Cake yesterday for Mardi Gras! It was a hit at the party!!! I so love whip cream, but don’t like putting the artificial stuff in my body…so am so excited about this. I get raw milk and have used the cream before for whipping but we just haven’t had the best results! THIS IS FANTASTIC!! perfect timing too as I’ve got to make a cake on monday and am sooooo nervous about whipping the coconut cream – I’ve had a few fails. lol. Thank you so much for the amazing tutorial and brand comparison! LOVE IT!! I absolutely adore coconut milk EVERYTHING and when I tried making coconut whipped cream a year or so ago, I 200% did not refrigerate the coconut milk first, which is exactly why I wasn’t successful. I’m going to be whipping all the coconut milk now that I know how it’s done! Thanks, my dear!! You know that BPA free means they use BPS instead, right? BPS is every bit as bad as BPA, if not worse. “BPA free” has become a way of tricking us into believing it’s safer. But it’s not, they just switched to another toxic chemical. Yes I am slowly reading and learning more about all of the BPA and BPS stuff myself. But I agree it does feel like trickery in many instances. At any rate, since BPS labeling hasn’t become a trend just yet, I was simply reporting on what is being posted on the sides of the cans, if anything at all. Hmm, I just had the opposite results. I have never had luck whipping coconut milk and have always tried it with Thai Kitchen. The cream is separated but there is not nearly as much cream as a can of Native Forest. I have just been trying Native forest lately and the cream takes up most of the can and came out of the can all nice and whippy like that my 6 yr old wanted to just eat it instead of put it in the smoothie. So fascinating April, as I said – I always found Native Forest to be the best but I had two cans this time that weren’t thick and just wouldn’t solidify. I am hoping it was just two off cans and not that they changed something about that product, I will certainly be reporting back, if that’s the case. 😉 Thanks for the comment. Bummer about Native Forest! That’s the one we use, because it’s the only organic coconut milk easily available to us. About 90% of the cans I’ve opened have a super thick layer of cream – even just sitting in the pantry at 70 degrees! Occasionally, I do get an “off” can…my guess is that maybe it’s an issue of mislabeling and it’s the Light coconut milk inside. I’ve found that if I shake the can and can’t hear or feel any movement, it’s always the nice thick one! Yeh that has always been my experience too. I just couldn’t believe I got two cans like that. I will definitely give it a try again and see, since I really prefer that brand. I agree could be an off can or mislabeled. I will certainly be trying the can shaking thing too. Thanks for the comment! Can you thin this out with anything to make coconut yoghurt do you think? Or whats the best recipe for cocnut yoghurt, anytime i’ve tried i fails miserably. Or would this be a better alternative to coconut yoghurt nutritionwise? I have not had the chance to try making a whipped cream out of coconut milk, but I would have gone “nuts” if it hadn’t of turned out right and not knowing why. Thank you for the comparisons, they are really helpful to someone like me, who is on a little tighter budget, and I would not have expected such a difference in textures. These kind of posts help me feel a bit more confident in trying something new. Cool! Thank you so much! I’ve been trying this for awhile and it always comes out soupy! I won’t give up! This is amazing, not only you showed us how to make it, but also you tested different brands!!!! Who does that?!! I loved it. Can’t wait to make my own. Thanks. A really useful post! 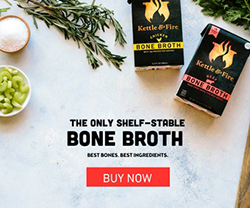 The brand comparison is really helpful as it seems that the success of this recipe can depend on the quality and consistency of the brand of coconut milk you use. I suddenly feel like a have a lot more options for lactose-free desserts! Thank you for the brand comparisons. I’ll be trying the whipped coconut cream soon. Thanks , Beth , for the step-by-step instructions. I’ve been looking for something different from dairy whipped cream. The product comparison is so helpful, too. You are so welcome Heather! Glad you found it helpful. Thank you so much for this! I just tried to make this, and had lack lustre results. I will defiantly look for these brands next time I try it! Thank you for this! I have had SO much trouble finding coconut milk that will solidify–even brands that other people swear by end up being watery and disappointing! I’m going to try the TJ’s and Thai Kitchen brands and see if one of those works well. Thank you for organized detailed experiment! Saves me so much effort!!!! Are we supposed to let it chill inside the closed can overnight that causes the separation. I poured it into a airtight lidded container and it didn’t work. Thanks. Hey Janice, I have always left it in the unopened can, never tried it in a container, so that could have something to do with why it didn’t work, but I cannot say for sure. Oh my goodness, thank you soooooooooo much for the recipe! All of my friends came over to my house and I made smoothies for them. I used this recipe with Sprouts coconut cream, and put it on top. It was a real winner. My uncle is lactose intolerant and he really wishes he could have whipped cream, I may just have to invite him over and give him as much of this as he wants!!!!! Again, thanks SOOOOOOOOOO MUCH! I am SO glad you did a comparison of different brands! 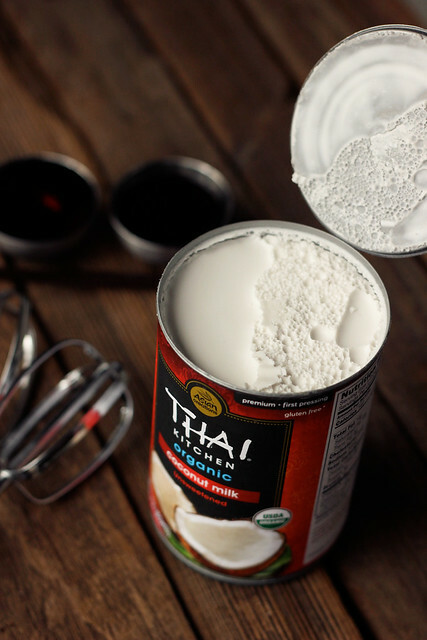 I do whipped coconut cream, as well as other canned-coconut-milk based recipes a lot, and always use the Thai kitchen brand, but I’ve had readers tell me that some of those recipes just haven’t worked for them. Now I’m wondering if their using a different brand, and that’s why. Great to know! So I refrigerated a can of Thai coconut milk overnight but when I opened it the next morning nothing solidified. I don’t recall it being shaken or tipped upside down so what could be the issue?? 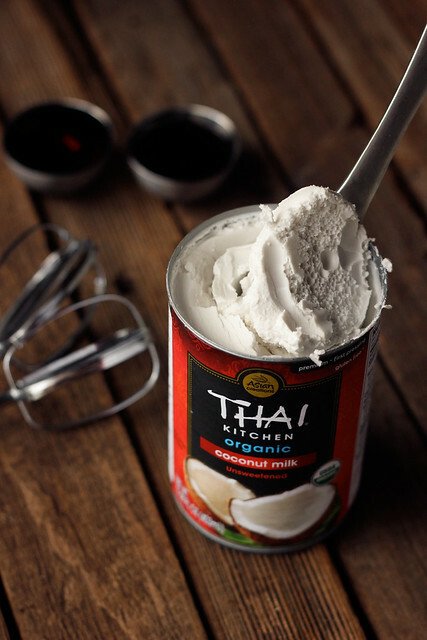 Just an FYI I tried this recipe with several different kinds of coconut milk, including Thai Kitchen but when I opened the cans they weren’t separated. Finally what I did was open to take the top off the can and then leave in the frig overnight and that did the trick! Lori, the one thing I really dislike about making whipped coconut cream is that lately the results are quite inconsistent, even with the same brands that I know and trust. Sometimes I buy several cans at the same time, of the same brand and one will solidify and be great for whipping and another won’t. It’s so frustrating. That’s a great tip on taking the top off, I will try that. That was very interesting. SInce cant eat wheat and a few other items give me digestive and other issues. Avoid the gums some add, many people have problems with the gums added to foods. Did find TJ coconut ?milk didnt have any and used that for some cooking. Wondered if you tried making coconut cream from the coconut itself. the whole coconut ground up does that. Am experimenting with Lets do organic- creamed coconut that is solid, though the fat separates in the plastic bag(is in a box). This is GREAT. And you are beautiful. Always nice to find a new blog with good ideas. I have friends that are getting killed by lactose whenever they try to ‘cheat’ using those pills, this is much better for them… thanks. Hi! I’m just about to run to the store. Quick question; do you think this can be frozen (like the unhealthy whipped topping comes)? I’d love to have it ready to use at a moment’s notice. Have you tried making it from scratch using the coconut meat? From a fellow conscientious-omnivore (love that btw), thanks for your hard work and great review of these products. I will tell you, even with my trusts brands, sometimes they just will not participate and separate they are supposed to and I don’t understand why. Next time I get them, they work great. I just don’t get it. Glad to hear that chilling it helped. Can you tell me if any of those brands are kosher? I’m preparing refreshments for my grandson’s Jewish day school for Chanukah, and all items must be kosher and prepared there. Sorry Judith, I am not sure of that I don’t follow kosher, so it isn’t something I usually look for in brands. I would suggest looking online or contacting the companies directly, if you want to know for sure. Sorry I cannot be of more help. Thanks so much for this post! I just tried this with a brand called Andre Prost. I had the can in the fridge for 3 days with no separation at all! Obviously, this was an epic fail, but I will look for one of the brands you have mentioned ! Thank you so much — excellent summary of the how-to and of the different brands. Beautiful blog. Excellent post. Great information. Thank you for doing all of the leg work and testing. Brand differences can truly make or break a great recipe. Especially when only relying on one or a couple of high quality star ingredients. Can’t wait to try it out. I will definitely be back soon to learn and discover more. Thank you Beth : )! This recipe made me click. Now I’m sick. Ps. What I meant is that it thickened quite a bit in the fridge, but without the pinch of salt didn’t thicken when I whipped it. Sorry for my confusing comment. Great idea. I’m glad I found your site. I wanted an alternative to dairy cream and this worked out nicely on my pancakes this morning. I used it with my fresh fruit topping. It definitely tasted different but it was yummy. I wish more restaurants would incorporate this into their menus. The way I read it, it’s 1 tablespoon of your choice of sweetener. Love this recipe so much! Thank you so much for sharing! I wanted to let you know that I tried Grace brand Classic Coconut Milk and it whips up wonderful! When I shook it in the store it was very solid. I bought it at Westbrook Market in Westmont, IL. The store is party of the Certified Grocer chains. I think the guy stocking the shelves thought I was a nut case shaking all the cans – LOL! Hi! I have a question: My kids and I dont tolerate guar, and prefer organic and BPA free. This leaves only Natural Value brand, which we can only find on Amazon by the case. With shipping it is a bit expensive for us (works out to 4.50 + per can and we go thru alot!) How can I make what you buy in a can, from scratch? If you blend dessicated coconut and hot water to make homemade coconut milk and squeeze/strain, you get a mostly thinner milk with little to no “cream”. How is canned coconut milk made so that enough of this thick layer of cream is there? Loved this review!! It’s clear and short enough to pay attention, just perfect! Now it’s time to try it all out! THANK YOU sooooo very much! 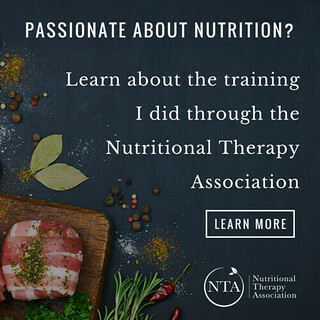 I am not a cook and this tutorial takes a lot of stress trying to figure out better ways to eat Keto!! Seriously, THANK YOU!! This frosting will hold up quite well at room temperature and it’s quite tasty, you could possibly opt for bakers chocolate and then add your own level/type of sweetener. Just a thought. Two things: All of Trader Joe’s canned goods are now in BPA-free cans, and I’ve been purchasing cases of Native Forest Organic coconut milk from Amazon for years, every single can that I have used is half-filled with solid cream. 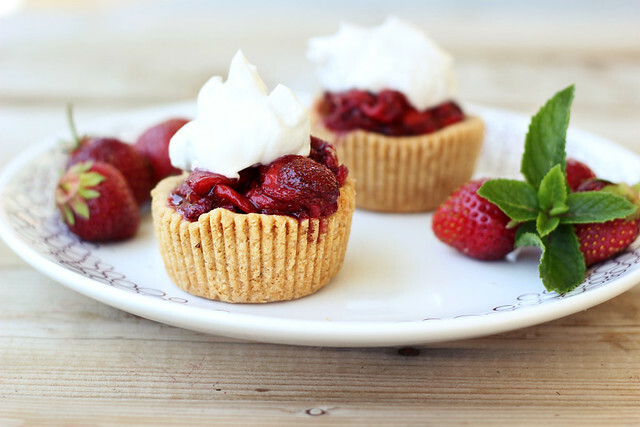 I’m pretty excited about trying this method as I won’t be able to have any regular whipped cream during our long fresh berry season this year. I think I got too much of the coconut milk into the cream and when i whip it together, it won’t fluffen up. Is there any way I can fix it? 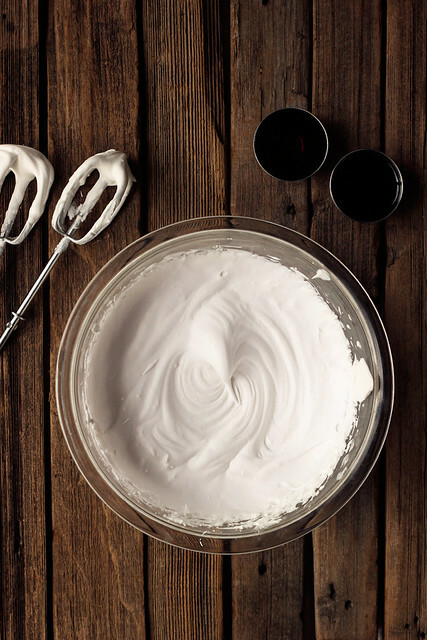 Thanks for sharing your experiences making whipped coconut cream. I have tried before but it never worked so I’ll try some of the brands you mention and follow your instructions carefully. Here in Canada, cans of Native Forest organic coconut milk do mention that they are BPA free 🙂 so it’s probably the same where you are, even if not mentioned. So funny that to mention that brands sometimes work – I just used Thai and it did not get thick. The recipe I was using did call for lemon juice, so I have to wonder if that had an effect. Usually this whips beautifully. What a delight to find your website and helpful instructions on how to make whipped coconut cream. I tried Trader Joe’s and it separated and whipped beautifully but we did not like the chemical after taste it left so am going to try the two other top brands. Thank you for your comparisons of different brands. beyond helpful! we are family working our way towards completely GF, minimizing our dairy and headed towards a mainly plant based lifestyle. 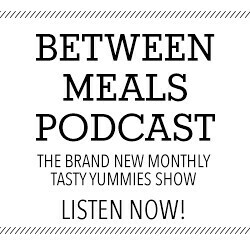 this seems to be an older post circulating on Pinterest but I will look for your recipes! Thank you! You’ve made my transition to a healthier lifestyle just that much easier. I just tried this and it worked fabulously. Have you tried the new extra thick canned coconut milk from Trader Joes? It pours like a thick water even after being in the refrigerated over night. I have used the old formula for years and it whipped up like your picture, but not any longer. The taste of coconut is lessened also. We have tried whipping in gelatin but it is only a little thicker. Help I miss my thick whipped coconut cream. I have never tried the coconut milk from TJs, no. I don’t love their canned coconut products, myself, too many additives. I still find thai kitchen to provide pretty consistent results. Thanks for your comment Susan. As I mention in the post, this isn’t an exact science, these brands are constantly changing their formulas and I have even found them to vary from can to can at times, even when buying at the same time. Since I created this post, more brands are selling just coconut cream, rather than milk, so yes, that makes it easier. However, I am mindful of which I will purchase, as many include additional additives and other ingredients. Like the Trader Joes brand. I love the idea of transferring to a clear glass jar to watch the results, that’s brilliant. Thanks for sharing! thanks for this useful information. I’ve been whipping coconut cream for a while with mixed results too. because most of the creams I’ve used have stabilizers they hardly have any liquid separated from them when left in the fridge. I just tried putting a can of chilled coconut cream into a sieve lined with a paper towel held over a bowl. I left it over night in the fridge and I managed to get a thicker consistency than I would have without doing this step. so if you find your cream to runny then you might try this step to get it a bit thicker. wow, great idea!! Thanks for sharing! Can you use the Thai brand 50% fewer calories, light coconut milk? Or will it not whip up as good too? No, it must be full fat, the fat is what causes it to solidify and consequently whip up. Lite will not work at all. Sorry about that. I absolutely love this recipe and have now used it in a few of my own. Thanks for introducing me and all of the hours you put into this blog and post. Hi. I trued using the Thai coconut milk and it separated way before 3 minutes using the blender on high. I did skip the chilling process – could that be why? 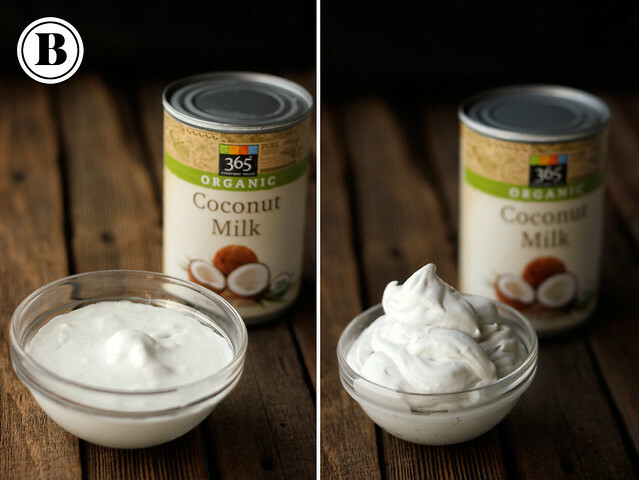 Have you tried making it from your own coconut milk? I was wondering if using two cups of shredded coconut to two cups of water would extract enough fat to make it work. Thoughts? Wow!! This is fantastic!! My husband and brother hate eating “clean” and I put it on their pancakes this morning for a huge success and a cascade of “Is there any more whipped cream?” Pretty amazingly wonderful. Also, I used a brand I found at Wal-Mart called Imperial Dragon, and it worked wonders. Thanks for the tutorial, I will definitely be making this in place of whipped cream from now on!! I had problems with a coconut cream that was very waxy but all crumbled and mixed with the water. I squeezed out by hand through a cheese cloth and got perfectly smooth cream without the water. The difference between cans of coconut milk is NOT because of the ingredients being used – I believe it’s because of the length of time the can has been sitting. I’ve been using coconut milk every day for MANY years – mostly Thai Kitchens. When the coconut milk is very FRESH – it is completely homogeneous, with NO separation at all. It is liquid and free-flowing. As the can sits on the shelf, though, it will begin to thicken and separate. Or buy a whole bunch on sale and then just let it sit in your pantry for a long time – don’t shake! 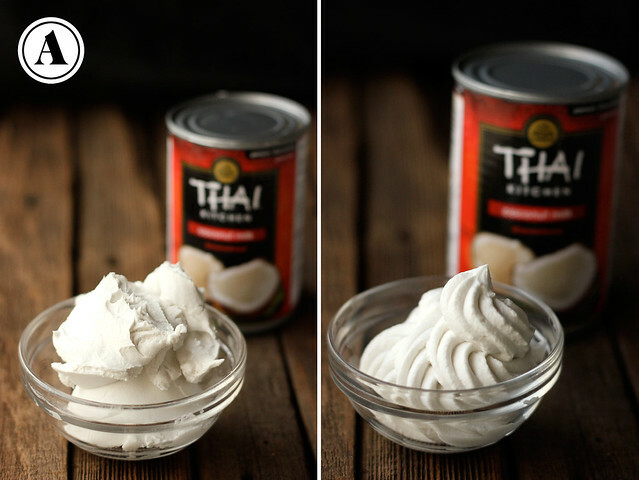 But now Thai Kitchens is making coconut CREAM in a can!!! It is quite thick. I haven’t tried it for whipping yet, but I hope someone here can try. It sure would be a lot easier than trying to find a separated can! Interesting theory, could explain why they vary so much. Old cans huh? Thanks for sharing and yeh, I am super excited about the coconut cream in a can, a couple of brands are now offering that. Good stuff. Oh by the way, I heard about separating the water from the cream that was kind of a duh moment for me. Turn the can upside down and open from the bottom, that way all you have to do is pour the water off and the cream stays put. I like this theory, I used the coconut milk that got the watery results and I honestly got the thickest cream I’ve ever gotten. It isn’t a good idea to make whipped cream from coconut cream in my opinion as it is so thick that it has a good deal of actual coconut oil in it and no matter how much you beat it the oil will not fully incorporate into the cream and you’ll end up with crunchy clumps. Not sure, I have never tried. I make this usually as a means to avoid dairy, so it wouldn’t make much sense in that way. The reason why it is inconsistent could be the age of the product. Just like peanut butter for exemple. When it is older, the oil separate. Maybe we can have better results with older coconut milk! Im thinking of using this recipe for my sons birthday cake however i would like to use natural sugars from fruits to sweeten it and add some flavor. Do you think adding pureed peaches and/applesauce would change the consistency? I would like to use it for piping. If you buy straight coconut cream how much would you use for one icing recipe? This was so informative and helpful. I can’t wait to try this. Thank you. Thanks for this post. I just thought I’d let you know that I bought 365 Organic Coconut Milk yesterday. The can, now, says the lining is BPA FREE.